Antonin Scalia, the "originalist" US Supreme Court justice who has strongly molded US law during his tenure, has died recently. Conservatives and many libertarians are wailing and gnashing their teeth. Perhaps rightly so. His horoscope helps explain his mostly-consistent record of interpreting the US Constitution as something resembling its original intent (unlike his more pliable peers). Apollonian: Pallas trine Mercury and sesquiquadrate Sun. Pallas co-ruler Pluto trine Sun and co-ruler Mars semisquare Mercury and square the Nodes. Dionysian: Pallas ruled by Pluto (which is parallel South Node) and weakly trine South Node. This puts Scalia between the "Libertarian" and "Statist" quadrant of "the Axis of Good and Evil". Actually, this by itself is enough to explain a personality that is more principled and logically-consistent than not. Collectivist: Venus sesquiquadrate South Node and ruled by Saturn which is opposite Neptune. 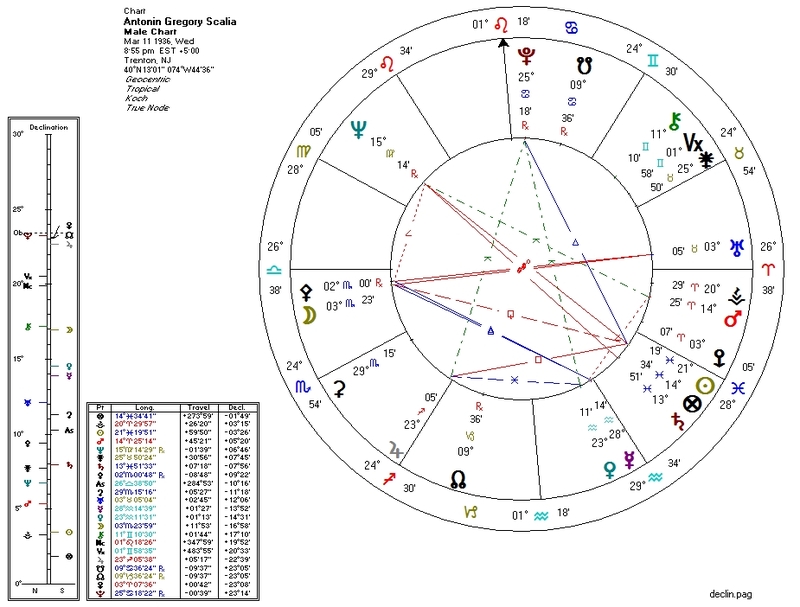 Second House co-ruler Pluto is parallel South Node. Liberal: Moon co-ruler Mars quincunx Neptune and co-ruler Pluto parallel South Node. Scalia may have identified as "conservative", but astrologically he's a weak or conflicted libertarian. His ideology was not driven by psychology (as is the case with most conservatives) but by logic. Pluto at MC in Cancer at the center of a yod between Jupiter in Sagittarius in the Third House and Venus/Mercury in Aquarius in the Fourth House: he was publicly seen as a conservative powerhouse, and was very vocally opposed by ideologues from the opposing party. Pallas opposite Uranus: the "world-builder" aspect. Scalia helped shape modern political America. Pallas septile Jupiter (which is parallel North Node): Pallas/Jupiter is a bit of lawyer's or philosopher's aspect. Scalia's death leaves an opening for overlord Barack Obama to appoint a replacement. It goes without saying that should Obama get what he wants for the replacement, the Court will become a rubber stamp for left-wing policy. The folks who despise "strict constructionism" as right-wing "oppression" and extol the virtues of a "living Constitution" philosophy have been celebrating. The "Living Constitution" is a euphemism for the idea that the letter and intent of the law are meaningless: the whim of elite are the law.